A client testimonial by Chris Drieberg on his tailor made trip through South America. Ten mutual friends took off on a memorable journey around South America not withstanding an unfortunate start to our journey. A late take off by Qantas from Melbourne and further delays in Sydney due to mechanical problems with our ongoing flight ending up, pending a whole day at the Sydney Airport and a night over in Sydney on the 9th. Our tour eventually commenced on Day 1, the 10th flying Sydney to Buenos Aires, Argentina with a transit stopover in Santiago, Chile. Gill, myself and the Holmes’ got our boarding passes and baggage through to Buenos Aires. However the Batholomeusz’, Deckker’ and Parsons’ were not that fortunate. The former two couples got their bags over 24 hours after in Buenos Aires and the Parsons’ 5 days later in Rio. On Day 2 a day tour of Buenos Aires served as a great introduction to South America. This incredible city gave us a taste of its fascinating history, architecture and culture. We explored the busy centre, including the Plaza de Mayo, where the Casa Rosada Presidential Palace is located. We also visited the aristocratic North, including Recoleta Cemetery, best known for Eva Peron’s grave and the working class South, such as the famous La Boca and San Telmo districts, heartland of the Tango. At night time we were entertained by an intimate & passionate tango show, housed in a cosy wood-panelled 19th century building with a colourful history as a meeting point for poets and students in the heart of Buenos Aires’s historic centre and included was one of the most varied a la carte menus. 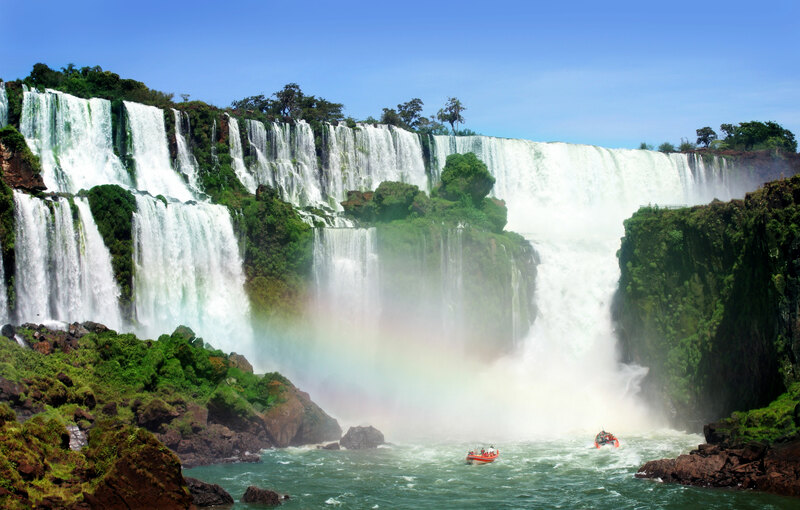 We then flew to Iguazu, Argentina on Day 3, the 11th and were accommodated at the La Cantera Jungle Lodge situated within the Iguazu Natural Reserve. The lodge itself was carefully built preserving the environment. The wood panelled rooms opened out to a private open balcony overlooking the Misiones Jungle. Early on Day 4, the 12th morning we visited the spectacular Iguazu Falls on the Argentinian side. We rode the rainforest ecological train and walked the paths to explore panoramic views of above and below the waterfalls. We were virtually on top of the Devils Falls and Jermeyn took the option of taking a boat ride under the falls. The morning of Day 5, the 13th we saw the falls from the Brazilian side of the border. While the walkways and steps allowed us to get close up to the spray, views of the Floriana falls, the Devil’s Gorge Canyon and the Iguazu River was a sight to behold. We then took a flight to Rio de Janeiro and were accommodated at the Porto Bay Rio International, located in the heart of Copacabana, a beautiful waterfront setting, gorgeous views, and across from the world famous Copacabana Beach. We made our way on Day 6, the 14th to the bottom of Corcovado Hill, where we ascended the mountain by coach, climbing 4km through the world’s largest urban national park, the Tijuca Forest and arrived at the statue of Christ the Redeemer. After some time with panoramic views we descended the mountain and visited the Metropolitan Cathedral, before passing through the bohemian neighbourhood of Lapa and its famous arches en route to Copacabana. We then had a traditional Brazilian BBQ lunch in Ipanema around the corner from the where the famous song “Girls from Ipanema” came about, before visiting another famous land mark by cable car, Sugarloaf. Click here to read the next post of Chris’s adventure.